Invisible Theatre's Pastime Players started as a workshop in 1984. Under the direction of Susan Claassen, the program has grown into a prototype of innovative arts education that focuses on ability rather than disability. Currently, the project is centered at Doolen Middle School in the Tucson Unified School District. Twice a week, exceptional education students receive instruction from Invisible Theatre’s artistic staff in music, drama and dance. Project Pastime is funded in part by The David and Lura Lovell Foundation, Foundation Carinoso, and The Mary S. Gorin Fund. Our generous funders allows IT to offer the program free of charge. 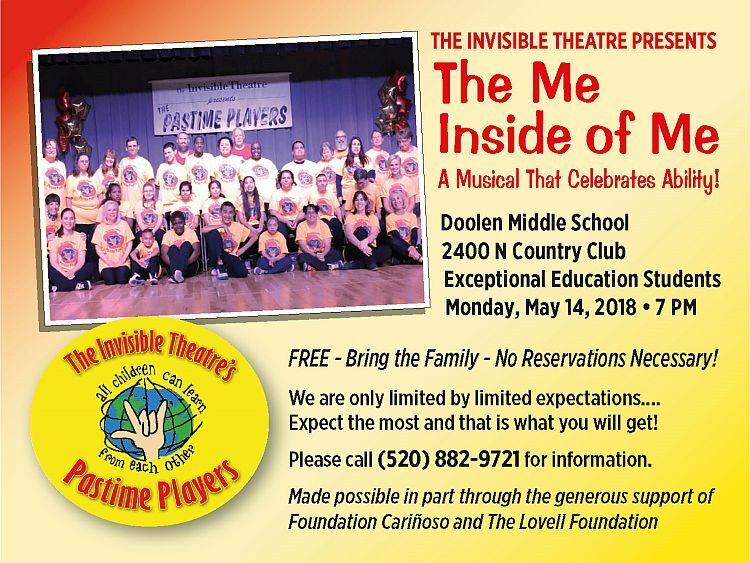 Pastime Players 2017-2018 will culminate with THE ME INSIDE OF ME, an original musical revue that showcases the special skills we all have to share. The production will be on Monday, May 14 at 7 PM at Doolen Middle School (free). THE ME INSIDE OF ME exemplifies the concept that when artists, teachers, administrators, donors, students and parents come together as a community – we really can make a difference! We are only limited by limited expectations – Expect the most and that is what you get!